Ryan D. Innes (BM ’08) and Amy L. Whitcomb (BM ’11) turned chairs on season four of NBC’s The Voice—and share many other accomplishments. Both began piano at age 4, singing around age 6 or 7, and trumpet a few years later. While at BYU they both studied media music and soloed in a cappella groups. Each won the opportunity to perform in front of 50,000 people at the Stadium of Fire in LaVell Edwards Stadium—Whitcomb placing in the top three in 2011, and Innes taking first place in 2012. The rush of competition was so intoxicating that each wanted to experience it again by auditioning for The Voice, where both made it through several rounds before being eliminated. Friends before the show, soulful singer Innes and pop-rocker Whitcomb supported each other during the contest. “There are stresses and frustrations that come with a TV show and a singing competition, and it was great having Ryan there,” Whitcomb says. 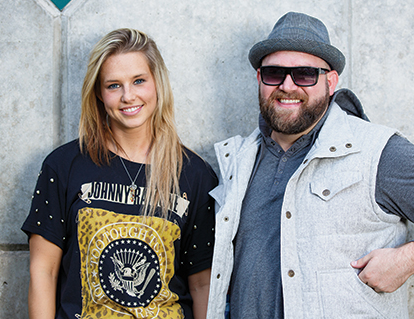 They continue to bolster each other on tour with Provo band Fictionist and with Midas Whale, a folk duo of BYU–Idaho alumni who also competed on The Voice.